Height 60 to 90 cm; spread to 60 cm. Prolific species with hollow stems, hairy ovate leaves, and blue or purple star-shaped flowers. Borago officinalis (common borage) is the most common variety and is widely available. Seed borage directly into the garden or, to get a jump on the season, set out young plants purchased from a garden centre. When: After the date of the average last spring frost. Where: Full sun; will tolerate some shade. Prefers sandy, well-drained soil; will tolerate poor soil. Space plants at least 60 cm apart. Borage is easy to grow! Although borage is drought-tolerant once the plant is established, young plants need lots of water. Don't give borage too much nitrogen. Fresh borage leaves can be harvested continuously, like spinach. The flowers grow in clusters called racemes; harvest individual flowers rather than the whole raceme. For best flavour: Remove the pistils and stamens (the black centre) before you eat the flowers. Leaves: Harvest as needed by cutting from the stem. Flowers: Harvest as they open. Clip the flower stalk where it attaches to the plant stem; discard stalk. Use only fresh borage leaves—they do not store well. Borage flowers can be frozen in ice-cubes. Borage is prone to aphids. Any vegetable crop that needs pollination—squash, cucumbers, and the like—will benefit greatly from a nearby borage plant, because borage flowers are a favourite of bees. If you choose to grow borage in a container, choose a large pot. The plants grow rapidly, so they need lots of room. Half whiskey-barrels are perfect. Borage looks much more attractive when it's grown with other plants. It looks wonderful when used as a feature plant with other culinary herbs surrounding it. The other plants can even help support the tall borage, which can be blown down by strong winds. Borage is rich in potassium, calcium, and vitamin C.
Dried borage flowers add a lovely blue colour to potpourri. Borage is often called "bee bread" because it attracts bees; indeed, borage honey is of very high quality. 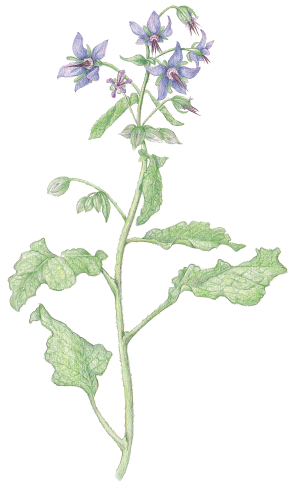 When burned, borage may emit sparks and slight explosive sound, like fireworks. Some speculate that the potassium nitrate content in the plant is responsible for the phenomenon; others feel it might simply be the volatile oils burning off. Native to the Mediterranean and western Asia, borage was purportedly planted by Columbus' men on Isabella's Island.